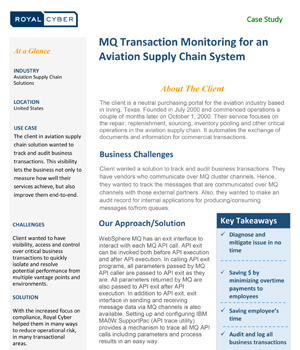 The client in aviation supply chain solution wanted to track and audit business transactions. This visibility lets the business not only to measure how well their services achieve, but also improve them end-to-end. Client wanted to have visibility, access and control over critical business transactions to quickly isolate and resolve potential performance from multiple vantage points and environments. With the increased focus on compliance, Royal Cyber helped them in many ways to reduce operational risk, in many transactional areas.